Having a mind map means not only to inspire big ideas or illustrate science concepts but also to apply it in daily life to improve your quality of life. 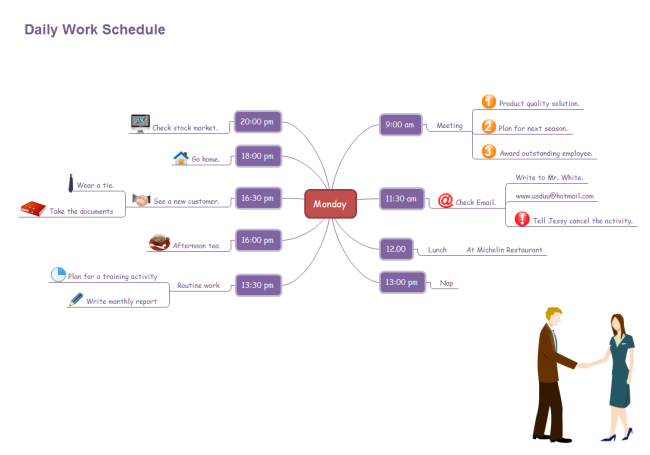 From your daily schedule to your life purpose, mind map can be a great helper for you. It is well-said that time is priceless. Managing your time well can lead to increase in efficiency and better chances of success. 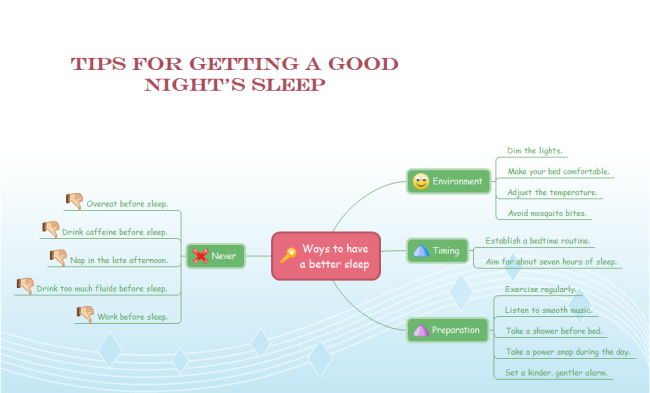 Mind map benefit you in time management by incorporating all important things you need to do in a single diagram, in a sequential way. As for those urgent tasks, you can add special symbols to raise alert. Compared with schedules made in PPT, Edraw is superior for its flexibility of alteration. You can add description to any shape by just double clicking it without adding text box. To make your life richer with various activities, you can make these activities go more smoothly aided by mind maps. 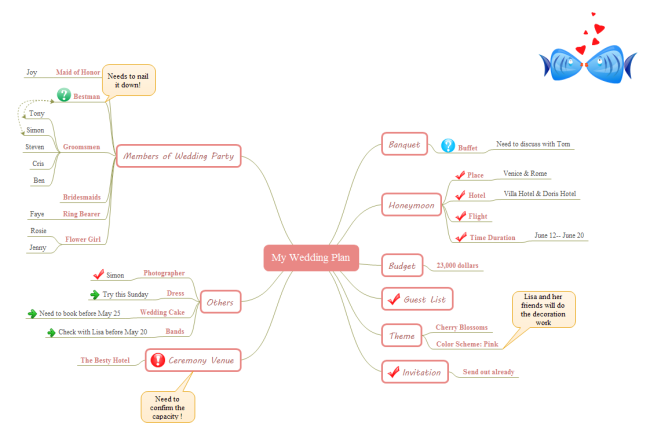 To name a few, you can include all Sunday activities in a mind map for choice; a barbecue mind map informs key matters to participants briefly but effectively and a wedding plan mind map helps you make your wedding the most unforgettable and sweetest day in your life. When your mind is in a blank, these mind maps really help. In our built-in example - Better Sleep, we offer some tips including: Establish a bedtime routine; Exercise regularly; do not nap in the late afternoon and so on. You can keep adding more to help you make better living habits. Gradually, these habits will ensure sound sleep just like babies' sleep. It is never too old to learn so taking note is not only the matter of students in school. During meetings or conferences, taking note using our mind map software can not only record the contents but also the structure and connections. It has been suggested that mind-mapping can increase learning/study efficiency up to 15% over traditional note-taking. In China, there is a famous proverb saying: "Move forward, or you'll fall behind." We must make progress constantly to keep ahead of others. The first step to accomplish this is to analyze yourself comprehensively. The related factors include weaknesses, strengths, hobbies and networking which are vital for your success. 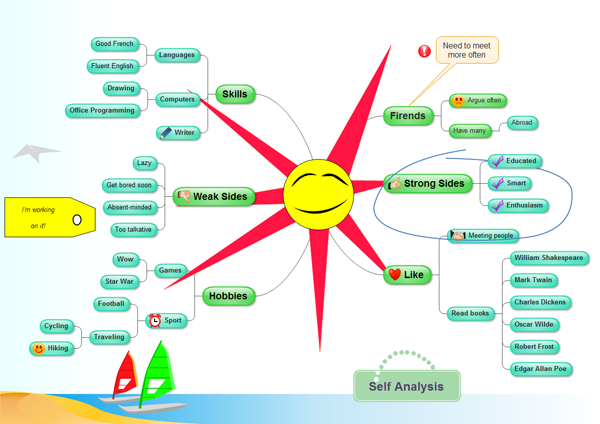 The following mind map is a great aid for doing self-analysis to achieve self-improvement. Everybody has the potential to think creatively but it requires proper inspiration. Here is a mind map about creative thinking. To learn more about suggestions about creative thinking, click on the following hyperlinked picture.